Summary: A good book if you are part of, lead, or want to lead a distributed (remote) development team. Also, if you’re interested in how to prioritize culture as an organization. But don’t expect much insight into the business behind WordPress. 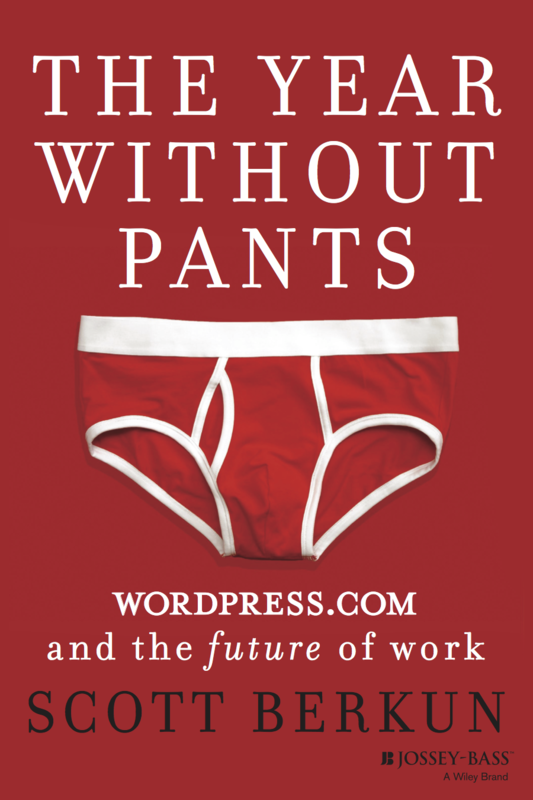 “The Year Without Pants”, by Scott Berkun, chronicles Berkun’s year working at Automattic, the parent company of WordPress. WP is used by millions of websites around the world to publish and maintain their website. Automattic is unique in how they operate as a distributed team, with employees coordinating activities from all over the globe. The way that this organizational structure impacts team productivity and morale is a key theme in Berkun’s book. WordPress has a huge impact on how people use the web (and I use it). 19% of web traffic according to some estimates; a good product and company to gain insight into. You don’t read much press about the company behind WP and the structure, processes, culture, etc. I wanted to hear how the WP open source project turned into a business, and how they make decisions on how to develop their product. Berkun was brought on by founder Matt Mullenweg to manage a software development team. He was one of the first team leads at a time when the concepts of formalized teams and leads was new. In this sense, the book can be considered an anthropological work with Berkun as the participant observer. It’s worth noting that Berkun’s relevant work experience was as a program manager at Microsoft – which I’d guess has a slightly different culture than WP. The book gives the reader an insider perspective on how software development works at WordPress, both from a cultural and execution perspective. You’ll also find a lot of management tips and anecdotes which makes “The Year Without Pants” an especially good read for anyone who is a part of, leads, or has considered leading a distributed team. Berkun is frank and open about his management style and how he interacted with his team members, even going so far as to publish some of these conversations. But if you want to gain insight into any sort of business and product strategy behind WP, you won’t find much here. If you’re considering reading the book you’ll want an idea of what WordPress is. WP isn’t an easy thing to explain since it’s not really one “thing”. WordPress started as, and still is, a publishing platform that helps people create and maintain a blog. Initially WP was a popular open-source project. Mullenweg then decided to build a business around the WP software as well as the vibrant community of users around it. This became Automattic, the company responsible for WordPress.com and related products. People use WP software in different places and in different ways. WordPress.com is part of Automattic and includes WordPress.com, a hosted version of the WP software similar to a Tumblr or Blogger. WP.com is the commercial heart of the business. The nice thing about WP.com is that users don’t have to deal with setting up the software themselves. The idea is to attract a broader base of users. The company WP.com also offers what it calls VIP services, which brings in revenue by helping large companies make highly customized blogs. WP.org is the keeper of the free, open-source version of WP. I use the version of WP available on .org for this site,on my blog using my own server. This level of setup is a headache for many users, effectively shrinking the addressable market for the software. In this post I’m going to refer to WordPress as WP because I can write it out only by typing 2 letters, as opposed to Automattic. But when you see WP, just think Automattic. I came away extremely impressed with the how the culture/mission/beliefs of WP have scaled with the company. Mullenweg has kept the original WP ethos alive. People work for Automattic because they care about the platform and believe in open source. This page at Automattic gives you a great sense of the team and where they are – other companies take note. The fact that the list is alphabetical makes sense given the companies lack of a strict hierarchy. WP views itself much more as a meritocracy. Overall Automattic is a company that prioritizes culture, which is less common than it should be. As mentioned earlier, what makes WordPress different than a lot of other companies is that teams are distributed – employees work remotely and communicate using tools like Skype and IRC. This demands a different team style, and has to be especially well-tuned for software development work well. Especially for web-based software, where websites are updated frequently and in near real-time. I’ve worked with remote teams before and could relate to the comments around building relationships over virtual conversations and coordinating work when you’re not physically present. “The Year Without Pants” provides a number of helpful management skills and tips for working with distributed teams. As a product manager I’m interested in the way that a company evolves its product. How do they decide what new products and features to develop? Is the founder still driving the vision, or has that been more distributed through the organization as it’s grown? At Automattic, founder Matt Mullenweg seems to set the tone in terms of product vision. He’ll comment on team blogs (called P2’s) and guides overall product strategy. That being said, there’s a lot of opportunities for employees to go from idea to market quickly. An engineer can have an idea and decide to build it himself or bring in other team members if necessary. This has its upsides and downsides. On the one hand – it’s empowering for employees to be given the freedom to come up with an idea, launch it, and impact the product and by extension millions of people. On the other hand, this can lead to feature glut and a product that, when viewed holistically, isn’t as intuitive as it could be. Berkun suggests that the type of structure WP has can make it harder for bigger, company-altering ideas to surface, be discussed and get implemented. This can be detrimental for any company, but especially technology and software companies . For example, consider the shift to mobile content creation. Could WordPress have been the go to place for mobile content publishing, instead of products like Instagram, Twitter, Tumblr, and even Facebook? I don’t see why not. I finished the book with one lingering thought. Berkun observes that at WP it was hard to propose big, transformative ideas. WordPress is in the business of helping people turn their ideas into media using tools that are readily available. The way that people publish content is always changing and these changes call for big changes in product and company direction. Can these dramatic changes, requiring big investments and big shifts in resources, occur quickly enough at a company like WordPress? The risk is that this leaves a company susceptible to competition that solves the same problem that they do, but in a different way that customers respond to. Keep an eye on Medium. But maybe WordPress is ok with that. The company doesn’t feel compelled to aggressively pursue new opportunities, with an eye towards a billion dollar exit. Perhaps Matt and team are ok continually improving and supporting the product, the user community, and the plugin ecosystem while staying (relatively) small. There’s no urgency to hire aggressively and invest in risky bets, such as building for mobile from scratch unencumbered by past thinking. If I was Mullenweg, what would keep me up at night is someone, somewhere is building the publishing platform for the next generation. They can build the platform because all they know is the present and the tools that are readily available. A lot has changed in the last 10 years and a lot will change in the next 10. Will WordPress be able to keep up? Only time will tell. But if not, at least they can say they stood for something. Which might be the most important thing of all. (Disclosure: if you click that link and buy on Amazon I get a commission. This did not impact my review). Previous post: Have knowledge? Forget it.